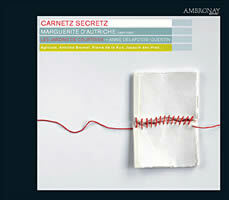 “Carnetz Secretz: Marguerite d’Autriche (1480-1530).” Works by Pierre de LA RUE (5); Antoine BRUMEL, Alexandre AGRICOLA, Josquin DES PREZ, Matthaeus PIPELARE, Loyset COMPÈRE (1 each). Les Jardins de Courtoisie, Anne Delafosse-Quentin (dir.). Ambronay AMY007 (http://www.ambronay.org/). Distributed in the US by Harmonia Mundi (http://www.harmoniamundi.com/). Last time I saluted Capilla Flamenca’s Margaret of Austria CD. Its all-male quartet exhibited a refined blend and devotional air — more chapel than court. Here an SATB team of soloists plies the reverse; instruments are similar, harp replacing Jan van Outryve’s eloquent lute. Soprano Delafosse-Quentin’s star turn on the anonymous “C’est ma Fortune” compels applause. (Three numbers reappear, all done differently.) A richly illustrated 80-page book the size of a CD case contains annotations. 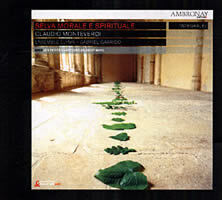 Claudio MONTEVERDI: Selva morale e spirituale (pub. 1640-41). Ensemble Elyma, Les Petits Chanteurs de Saint-Marc, Gabriel Garrido (cond.). Ambronay AMY001 (4 CDs) (http://www.ambronay.org/). Distributed in the US by Harmonia Mundi (http://www.harmoniamundi.com/). Getting past the sound’s wow factor requires work — effortless climaxes, plentiful bloom and low end, a hyperdetailed continuo. Garrido has the nervous energy in the four-part Messa da cappella exactly right; Monteverdi is pushing against the stile antico’s limits. Messa concertata breaks the mold, its 12:05 Gloria trying out most of the toolkit brought to these other occasions. In the solo motet Ab Æterno, bass Stephan Imboden displays power and lightness, aided by bold lute playing. Dramatic logic is the keynote here, the eight-part monuments Dixit Dominus I and Magnificat I serving as pylons. Transparency is pursued (the children’s choir) within the largest forces Monteverdi employed for a given piece — airy but not weightless. Notable throughout, Adriana Fernandez’s agile soprano commands the heft to ride atop the ensemble in Confitebor tibi Domine III. Her “et terribile nomen ejus” (and reverend is His name), tossed off at full acceleration, flashes by stunningly. This Vespers service may be speculative, but Selva has all the components except the chant (located in a 1585 source). Moving from that to the florid concerto stylings of Dixit Dominus II imparts a jolt. I incline more towards Renaissance art than Baroque, so the academic stuff delights. A sober double-choir Credidi recalls mid-16th-century Venice, and Les Petits Chanteurs especially distinguish the “little” Magnificat — chilly white tones that make Et misericordia one to put alongside Bach’s. In the monodic items, the leaks / links between Monteverdi’s theater and sacred music are most apparent, which may cast this final CD as a good place to begin. Stephan van Dyck’s tenor Salve Regina I is enhanced by echo effects and Fernandez enlivens her two duets, matching her partner’s line before igniting fireworks. Her Lamento d’Arianna (here called Pianto della Madonna) hits every shade on the route from protesting to tenderness. Credit also the plucked, rumbling accompaniment.